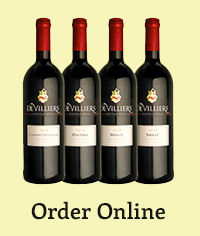 The De Villiers family introduced their first-hand experience in the Art of Winemaking to South-Africa more than Three Centuries ago.The continuation and fruition of these noble traditions is perpetuated by our Company today.These Wines are personally selected by Villiers from the choicest vineyards in the Cape;one of the oldest wine producing regions in the Southern Hemisphere. Produced from selected bush vines in the Wellington Region Wine of Origin – the birth town of Dr Izak Perold, creator of the unique South-African Pinotage grape varietal. The colour of this Pinotage is deep garnet red and clean in appearance. On the aroma the wine displays upfront red berry fruit and ripe plums, mulberries and strawberries, yet a hint of smoky nuance adds a multi-layered nose. The palate follows the nose with plum flavours and red berry fruit. The unique tropical banana characteristic of Pinotage is amply identified. Finishing very slightly sweetish on the lingering aftertaste, this Pinotage will match well with slightly matured and matured cheddar cheeses, lamb, Springbuck Roast and Neck and barbeque-braai’s. Due to the excellent quality of the fruit, this wine is made of 100 % Merlot – A smooth full-bodied wine with hints of plum, cherry, mint and chocolate flavours on the palate, finishing off with an extraordinary soft elegance. Deep garnet rouge in colour with aromas of fresh cream, plum yoghurt and tobacco. It pares excellently with leg of Lamb, braised quail, duck l’orange and ox-tongue. A full bodied Shiraz with intense berry flavours. True to its Eastern origin, this Shiraz varietal wine is rich in spices with layered berry fruit and soft integrated wooden undertones which enhance its velvety palate – A delicately perfumed fragrance of Violets and Rosemary on the nose. Served and complimented with Indian Curry, Cape Malay Bobotie and Morrocan Tagine and Lamb\Mutton. This Cabernet Sauvignon has a classic taste with a dash of rich raisin, blackberry and spices ending with depth – A full bodied and well balanced wine that leads to excellent maturing potential. The ideal wine to accompany steak, hearty roasts and game dishes. Hierdie Cabernet Sauvignon het n klassieke smaak met n sweempie ryk rosyne, swart. Bessie en speserye wat eindig met diepte.As volrond-gebalanseerde wyn het dit uitstekende verouderingspotensiaal. Die ideale metgesel vir gebraaide vleis asook oondgebakte vleis en wild. De Cabernet Sauvignon heft een klassieke smaak met een sweempje van rijke krent, swarte ker en specerijen en eindigd met een grote diepte. Als n volronde gebalanceerde wijn heft het n uitstekende verouderingspotentiaal. Het ideale compliment tot gebraden vlees, oven-gebraden vlees en wild.